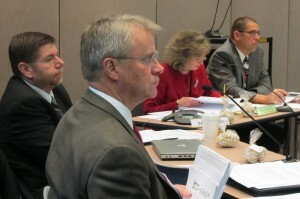 State Board of Education members Brad Oliver, Dan Elsener, Superintendent Glenda Ritz and Troy Albert listen to a presentation during the Dec. 20 meeting. UPDATED, 2:17 p.m. — The State Board of Education approved new operating procedures Friday that could be the first step in easing tensions between Indiana’s elected superintendent and appointed board members. Read the new operating procedures here. 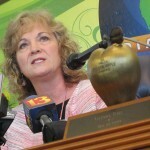 Anticipating a motion to limit state superintendent Glenda Ritz‘s authority as board chairwoman, her supporters flooded the other board members’ inboxes with messages this week. But such a move never materialized. Instead, the board voted unanimously to approve mutually agreed-upon operating procedures hammered out with the help of the National Association of State Boards of Education, the outside group brought in earlier this month to help mediate the tension. The biggest change? Ritz, who before set the final agenda by virtue of sending it out to the rest of the State Board, now must accept items from all members. “No Board member can be deprived of the basic rules of Board membership, including the right to place items on the agenda,” according to the new operating procedures. Board members have complained in the past about their motions not making it onto the agenda for consideration. A spokesperson for the Center for Education and Career Innovation, the new agency Gov. 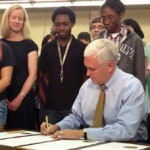 Mike Pence created over the summer, confirmed all requested items would appear on Friday’s agenda. But the new operating procedures aren’t likely to solve all of the problems: The document doesn’t specify who chairs the board in Ritz’s absence. It also doesn’t outline the process for recognizing board counsel, a problem that’s led to bizarre scenes at past meetings when attorneys for CECI and the Department of Education provided conflicting advice.